Lawrence (Larry) Kudlow ’69 has been named director of the White House’s National Economic Council, making him one of President Donald Trump’s top economic advisors. Kudlow, the former host of CNBC’s The Kudlow Report, replaces Gary Cohn, who resigned last week, reportedly in opposition to Trump’s plan to impose tariffs on steel and aluminum. Once described by the Washington Post as the “reigning optimist on Wall Street,” Kudlow did not start out in the field of economics. Instead, he earned his bachelor’s degree in history, then attended Princeton University’s Woodrow Wilson School of Public and International Affairs, but left without earning a degree. 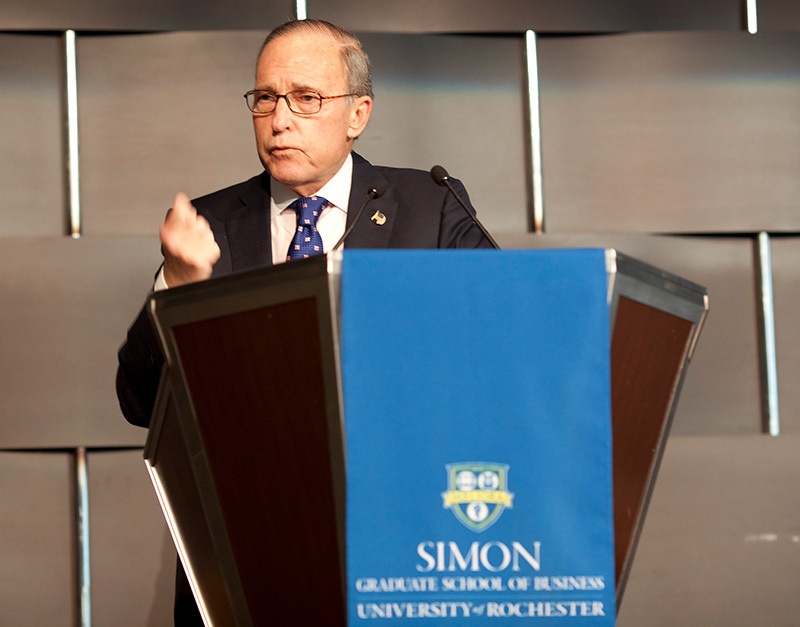 His economic career began with his post as a junior economist at the Federal Reserve Bank of New York, which was followed by stints at Paine Webber and Bear Stearns, before joining the Reagan administration as associate director for economics and planning in the Office of Management and Budget. “Kudlow is a guy who does not mince words and is not afraid to take on the lion in his own den,” says Peter Regenstreif, a professor emeritus of political science who taught Kudlow at Rochester. Despite Kudlow’s stance on tariffs, his ideas on economic growth as the primary objective of government are well aligned with Trump’s, according to David Primo, the Ani and Mark Gabrellian Professor and associate professor of political science and business administration. Kudlow is the author of American Abundance: The New Economic and Moral Prosperity (Forbes Custom Publishing).